We’re back by the water with another glass negative shot by John B. Capewell of Westville, New Jesrey about 100 or so years ago. My guess is that this photograph was taken on the same day and in the same place as the shot of the wading children in last week’s post. It looks like everybody is trying to escape the heat as well as indulging Capewell’s photography. 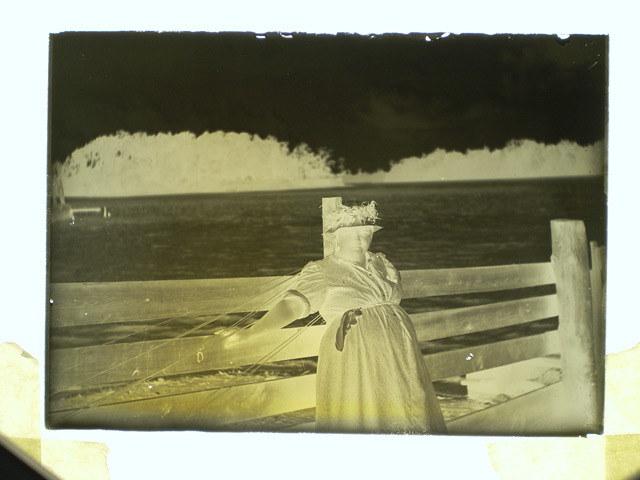 I don’t know who the woman is, but she shows up in a number of the glass negatives in the collection. It may be Capewell’s mother-in-law. Maybe an aunt. It’s an interesting photo because she is down-dressed rather than dressed to the nines as in other photographs. It was probably too hot to be fashionable. As with all of the photographs in the Capewell Collection, I placed the 5-inch x 7-inch glass negative on a lightbox and shot them with a digital camera locked down on a tripod. The processing was done digitally on a Mac using Adobe Photoshop. I disagree with the information that Bill Hangley Jr. supplied on this image. There is no doubt that the structures on the Pennsylvania shore are coal docks, but they are not the ones the Philadelphia & Reading Railroad constructed. Rather, these docks stood at Greenwich Point (formerly Gloucester Point) and belonged to the Pennsylvania Railroad. The vessel located mid-river was a very important steamer to the fisheries up and down the Delaware. This is an image of the United States Fish Commission steamer FISH HAWK, constructed in Wilmington, Delaware, in 1879. She was a floating shad hatchery and provided new fry fish for the commercial fisheries that lined the New Jersey shore of the Delaware. The FISH HAWK measured 146’8″ long, had a breadth of 27 feet, and a draw of 11 feet. Her gross tonnage was 441 and her net tonnage 206. She was well known along the Delaware and you should be able to find additional information about her on the internet. Judging from his website, Jerseyman really knows his stuff so I’m taking his word for it. I’m not a historian. I’m just the guy who wound up with 200 glass negatives. I’m so happy that people who are historians or just interested are stopping by and giving me their two cents. Stick around – there’s more!!! 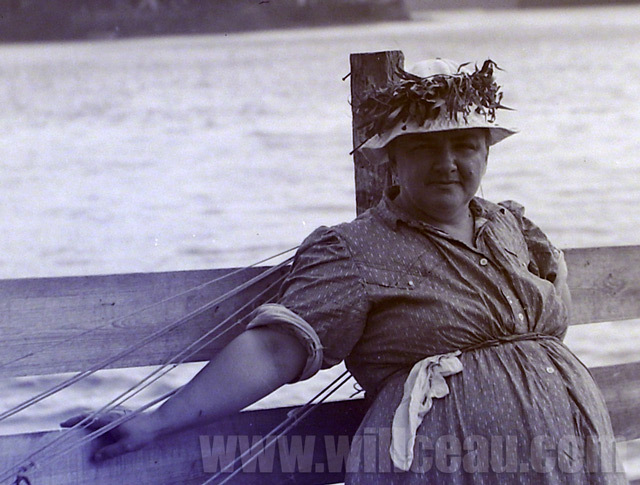 This entry was posted in The Capewell Glass Negative Collection and tagged 1900-1910, analog, antique photograph, Delaware, Fish Hawk, glass negative, heat, Jerseyman, John B Capewell, lady, New Jersey, photgraphy, summer, The Capewell Glass Negative Collection, vintage, water. Bookmark the permalink. The lady is Emily Oliver Evans . She was Ella Capewell s mother. 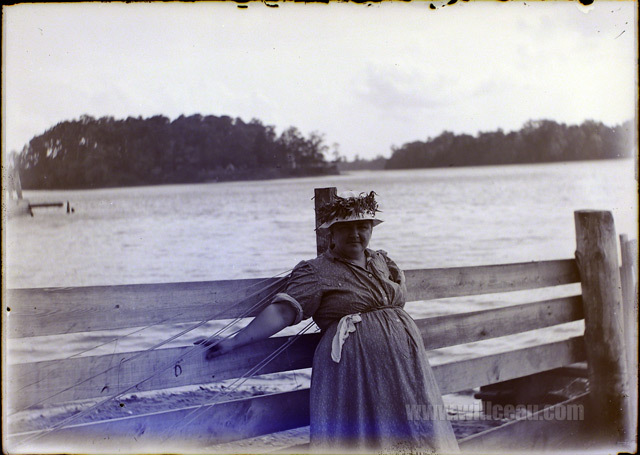 I believe this was taken on the Sassafras river in MD at the home of her sister in law Helena Evans Ross. I’ll verify the location. With a then and now . Thanks for sharing the information. Thank you so much!